Electronics won’t always be rigid, brittle wafers contained in bunch of complex circuit boards. 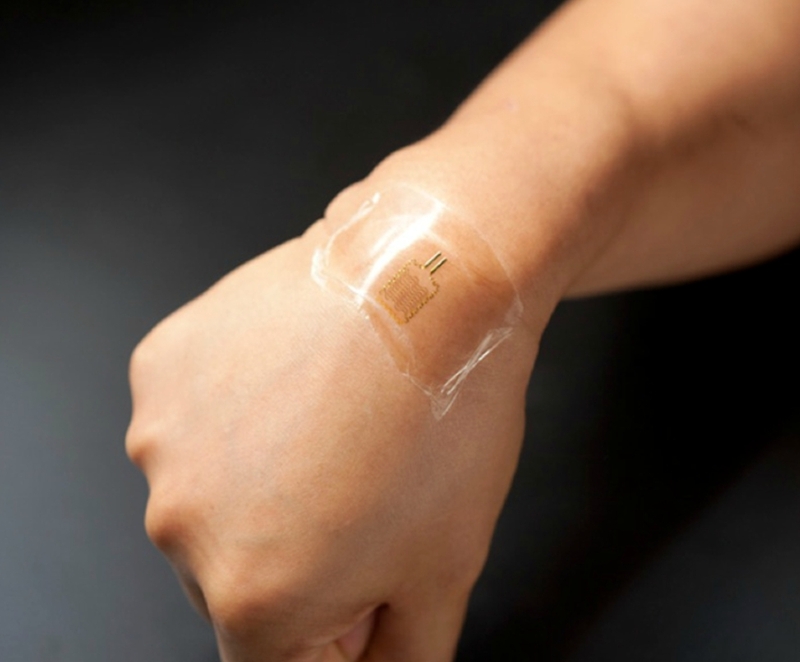 Recent advances have brought us almost to the point of “printing” the chips onto human skin. Researchers at Massachusetts-based startup MC10 have been working on commercializing a stretchable electronics technology that will be soft and conformal to the human body so that they can stretch, twist and move. The company’s CEO, David Icke, spoke about this new skin sensing technology called the “bio-stamp” at the World Economic Forum’s Annual Meeting in Davos. He said the bio-stamp can measure a person’s heart rate or EKG when worn on the skin or measure signals from the brain if worn on the forehead. It can also report muscle activity, temperature, motion and strength. According to Icke, future uses could include minimally invasive or implantable medical devices. The technology behind the bio-stamp has been developed by University of Illinois materials scientist John Rogers, a company cofounder. The stretchable Bio-Stamp is formed by depositing gold electrodes and wires that are just a few hundred nanometers thick onto silicon wafers by conventional means, then peeling them off and applying them to stretchable polymers. Unlike organic polymer electronics that can only bend, this approach makes electronics that can stretch and are faster than devices made of organic semiconductor materials, so they can provide precise real-time biological readings. MC10 is currently in a partnership with Reebok for developing a wearable sensor product using the bio-stamp technology that is expected to be released in 2013. This sensor will be able to detect heartbeat, respiration, motion, temperature and maybe even blood oxygenation. It will also be able to wirelessly transmit information to a nearby smartphone. A phone with a near-field communication chip can be waved over the patch, or the patch can be paired with a thin-film battery made by a commercial supplier, allowing continuous data transmission. David Icke says they are currently working on these features. Looking at all these developments in wearable electronics, I can’t help imagining a day when we’ll be ‘tattooing’ a smartphone on our forearm instead of carrying them in our pockets.